Stringent dieting can dramatically reduce the risk of heart disease, a study shows. Researchers at Washington University examined people who had curbed their calorie intake and avoided processed foods for a number of years. They were found to have the health of people decades younger, the study in the Proceedings of the National Academy of Sciences said. 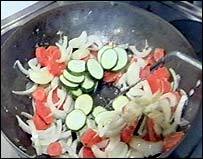 UK experts said even small adjustments to diet can improve people's health. The research suggests that long-term dieting can provide powerful protection against both heart disease and diabetes. Levels of "bad" cholesterol and triglyceride blood fats were very low in the people studied. And the group, whose average age was 50, had blood pressure readings similar to that of the average 10-year-old. Professor John Holloszy, from Washington University School of Medicine in St Louis, who led the study, said: "It's very clear from these findings that calorie restriction has a powerful protective effect against diseases associated with ageing." Research has consistently shown that stringent calorie restriction can increase the lifespan of mice and rats by about 30% and protect them against cancer. But the long term effect of such dieting on humans has been unclear. Professor Holloszy's team is thought to be the first to look at individuals who had been on a low-calorie diet for a long period of time. By consuming small amounts of nutrient-dense foods, members of the group try to take in between 10% and 25% fewer calories than the average American. The 18 individuals who joined the study had been following this dietary regime for between three and 15 years. They ate a wide variety of vegetables, fruits, nuts, dairy products, egg whites, wheat and soy proteins, and meat. They avoided all processed foods containing trans-fatty acids, as well as refined carbohydrates, desserts, snacks and soft drinks. The scientists focused on risk factors for atherosclerosis, the narrowing of arteries that can trigger heart attacks or strokes and is the leading cause of death in the Western world. Insulin concentrations - one of the markers of diabetes risk - were also as much as 65% lower than they were for people with a normal diet. Dr Luigi Fontana, who also took part in the research, said: "These effects are all pretty dramatic. "For the first time, we've shown that calorie restriction is feasible and has a tremendous effect on the risk of atherosclerosis and diabetes." Dr Ian Campbell, president of the National Obesity Forum in the UK, said the findings could prove useful. He said: "What we do know, and what this study backs up, is that avoiding unnecessary calories and maintaining a healthy weight leads to significant health benefits. "Normal people making sensible adjustments to their diet and exercise can have a significant impact." But people often needed assistance from their doctor or a weight loss group to help them with weight control, he said. Dr Tim Bowker, associate medical director of the British Heart Foundation, said: "To a certain extent, these findings are not surprising. It tends to underline just how unhealthy the typical Western diet really is. "However, it should be noted that the study was performed in a small group of selected individuals. "Nevertheless, it is encouraging to see just how much difference can be made to one's health through several years of following a healthy diet."